The PSU-24V-UNIVERSAL is a low cost 18W switch mode power supply with a regulated 24V dc output suitable for powering many of Omega's dc powered products or process current loops. 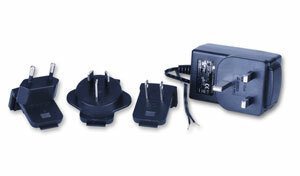 It is supplied with interchangeable mains input plugs suitable for use in the UK, US, Europe or Australia. It features approvals to international standards and has a 1.8 m long output cable with stripped ends.